Mickey’s Not So Scary Halloween Party 2016 parties begin on September 2 and each guest can pick up a special, complimentary Sorcerers of the Magic Kingdom car that will feature Clawhauser from Zootopia. Clawhauser devours sweets in this years special card. 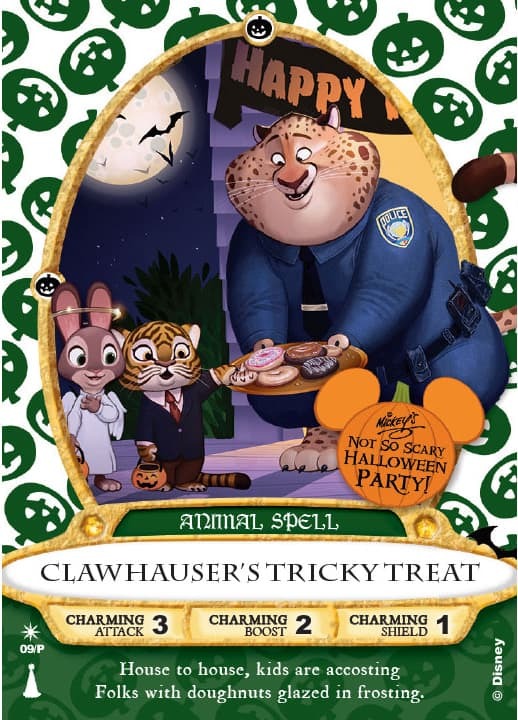 His card will create a special spell called “Clawhauser’s Tricky Treat.” Dozens of donuts appear on screen to combat the villains. Great idea for a spell, right? Sorcerers of the Magic Kingdom is a free in-park interactive game that any Magic Kingdom guest can partake in. You’ll help overcome a bevy of Disney villains by using the cards to cast special “spells.” It’s only available in the Magic Kingdom. You can pick up your free party exclusive card after getting your party wristband. Just stop by the Firehouse on Main St. USA to pick up your card! You’ll also receive your regular pack of 5 cards for the day when you pick this up. My kids have collected the series of free cards and enjoy playing the game from time to time. 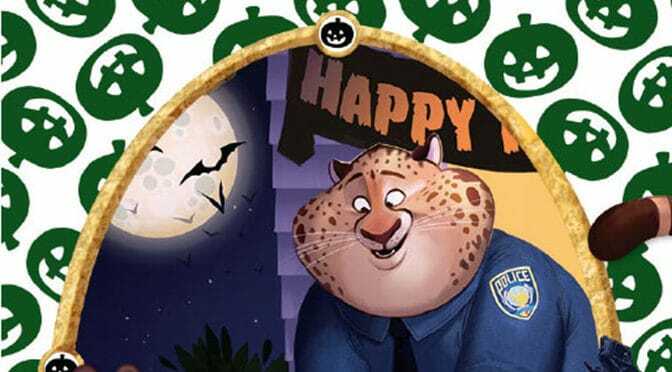 What do you think about the new Clawhauser card? If I plan to enter at 4pm for MNSSHP, but have reservations at BOG at 4:05, will they let me in a few minutes earlier to get there on time? I definitely want to pick up this card! I was waiting to hear about it! Thanks for the info!!! I’m very excited for this too. We’ll be down there for the 10/6 party. We’ve never done the Sorcerers of the MK card game before, but my girls love collectibles and this is a great one that’s free! And we’ve all seen Zootopia several times and love it. My daughter LOVES Zootopia! She got Judy and Nick magic band decals for our trip next week! Thanks for sharing! My daughter loves zootopia so this will be a hit with us!! This is first time at MNSSHP. We will be in MK already that day. Do we bring our MNSSHP tix with us and get the bands at the firehouse starting at 4? Just trying to understand where and when we can get the wristbands. Can’t wait for your webinar this weekend – Getting so excited for this trip!!!! From my previous experience, they setup tents where you ‘check-in’ to get your wristband and trick’or’treat bags starting @ 4pm. In 2015 the tent was just to the right of the castle in the circle when you face towards Tomorrowland. However I’ve always been told to take your paper tickets printed off just in case! We received credit card type tickets in the mail from Disney. I will bring those with me and assume I show them at the tent. Sounds like we won’t need to go all the way to the beginning of the park to get the wristbands and trick-or-treat bags, but will need to go back to the firehouse to get the special card. Thanks for the responses and advice! You get the band at front of park or Buzz Lightyear, then get card.